Today, we’re turning a new page, and we are very proud and pleased to unveil to you the new face of the Myposeo tool and company, as well as its new identity to support our growth and ambitions. Welcome to Myposeo Pro! Since our launch in 2010, the Myposeo tools have constantly evolved to better respond to SEO issues. We have spent several months working on a new interface, a new graphic identity that will allow you to put forward new offers in the near future. 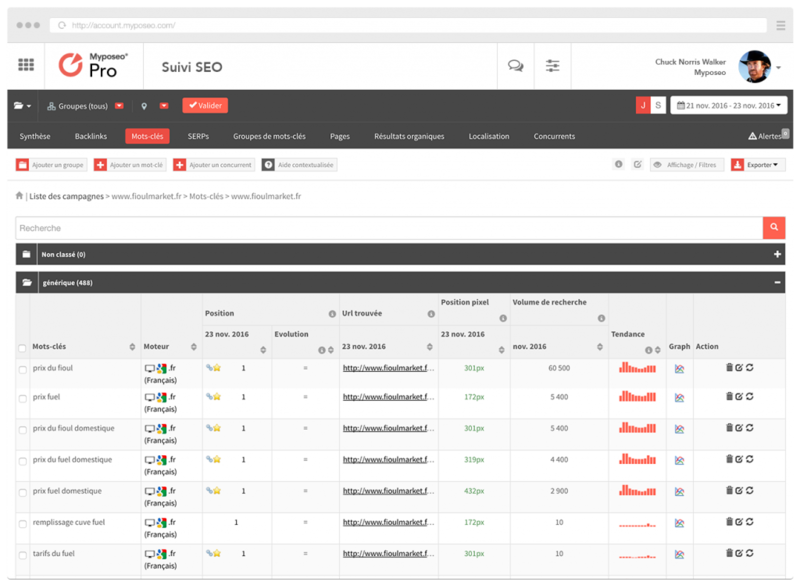 This update is accompanied by new, very important functions which we will introduce to you: a detailed SEO tracker, new synchronisation tools for Google Analytics and Search Console, and an intuitive and powerful key-word suggestion tool. Here’s the new Myposeo charter. Not all SEO managers, traffic managers or marketing directors have the same needs in terms of analysis and tracking. Equally, they do not all have the same level of expertise. This is why we have decided to re-name our current offer “Pro”. This is extremely comprehensive and can make itself more complex according to the dozens of indicators and complementary tools used. It has significant capabilities in reporting and in the volume of data tracked and processed. New offers will shortly be put forward to allow us to adapt to all needs. That’s why we’ve called this offer Pro. The biggest change in this update is the menu, which from now on will be situated at the top of the page. We have effectively deleted the left sidebar, which allows a larger and more ergonomic workspace. 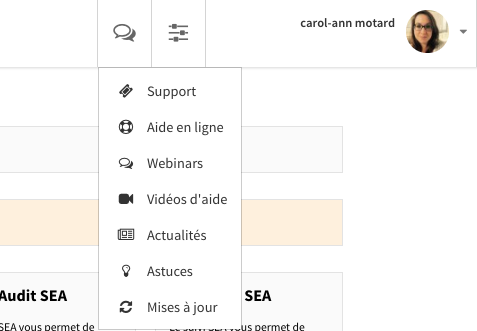 From now on, you will find all tools by clicking on the menu icon which can be found at the top left, next to the Myposeo logo. The name of the tool you are working in is displayed in the menu bar. In order to help you find information, tips and other uses, you will now have direct access to all help sources to get familiar with the tool. In addition to technical support, all our webinars and presentation videos, and news shared on our blog, you can also find tips and other uses, and updates for the tools. The first logo showed a target with a baseline “search engine position everyday”. A spring clean during a major update of our website, to better respond to the design code of the time. We would like to thank all our team members (developers, marketing, project management) who have contributed and continue to contribute to the success of Myposeo since its launch. This change of identity reflects the experience that we have accumulated over recent years, allowing us to put forward tools that are more and more powerful and practical. We hope you will like it. Thanks also to the great design studio Source Interactive, who supported us in this project. 13/08/2012 SERP position on Google : how does myposeo count ?